An investigation has raised safety concerns about the most commonly used type of silicone breast implant in the UK. Women in France are now being advised not to use “textured” silicone implants while authorities investigate links with a rare form of cancer. British women are still having the implants put in and there has been no warning from the UK regulator to stop. It says it will take action when it sees there is a problem. Manufacturers say the safety of the implants is supported by extensive testing and studies, as well as more than a decade of use in America and Europe. The BBC’s Panorama programme has been investigating implants with the International Consortium of Investigative Journalists and organisations around the world, including the Guardian newspaper and the British Medical Journal. Janet Trelawny had breast cancer over 20 years ago. Her breasts were removed and replaced with textured implants. Now, she has been diagnosed with breast implant associated lymphoma (BIA-ALCL). It is not breast cancer but a type of cancer of the immune system. In most cases, it is found in the scar tissue and fluid near the implant. But in some, it can spread throughout the body. She said: “It’s frightening to think that something that I’d done because I’ve had a cancer previously has then caused me to get cancer again. Janet is waiting for further biopsy results and has been told she will need to have chemotherapy to treat her cancer. The French have been investigating breast implants since 2011, when they started receiving reports of BIA-ALCL. The risks of developing it after an implant vary around the world but are thought to be very small. As of September 2018, the MHRA has received 57 reports of ALCL in patients with breast implants, 45 of which meet specific diagnostic criteria. That puts the estimated risk of BIA-ALCL at about one per 24,000 implants. BIA-ALCL appears to have occurred with textured implants made by every manufacturer, according to the British Association of Plastic and Reconstructive Aesthetic Surgeons (BAAPS). Breast implants come with different fillings and different surfaces – smooth and textured. In the UK, 99% of breast implants used are textured, according to BAAPS. Dr Suzanne Turner, an expert in breast implant associated lymphoma at Cambridge University, said: “It is a concern, absolutely, particularly now that we’re seeing breast implant associated lymphoma developing in these ladies. The investigation discovered that some manufacturers did not carry out adequate tests before selling textured implants to the public. These tests are called biocompatibility tests and they assess how the body responds to a product. Some manufacturers now say that they have completed the necessary biocompatibility tests. But the secrecy around the regulatory system does not allow us to see what was done. 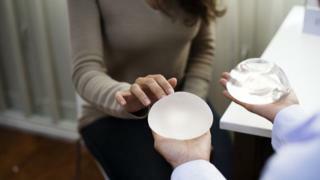 The investigation has also found out that manufacturers in Europe and America have under-reported problems with breast implants. Some haven’t told regulators when the implants rupture, because they say it’s a routine event. Nobody knows the scale of the risks, because the implants haven’t been adequately tracked when they’ve been put into people and problems may take years to develop. A register for breast implants was set up in 2016 but at the moment it’s still voluntary. Carl Heneghan, professor of evidence based medicine at Oxford University, says campaigners have been asking for a register for 25 years.